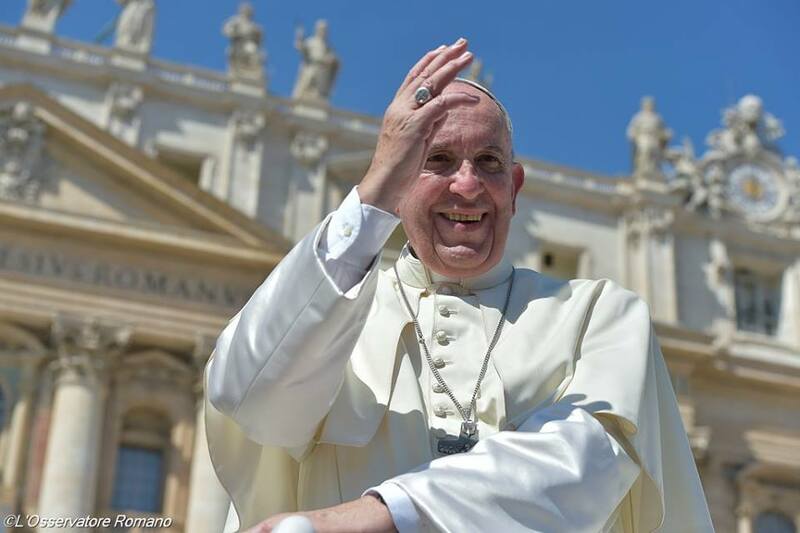 Pope Francis on Saturday addressed members of the International Federation of Catholic Universities at their conference on, "Refugees and Migrants in a Globalized World: Responsibilities and Responses of Universities". I greet you at the end of the International Conference entitled Migrants and Refugees in a Globalized World: Responsibility and Responses of Universities, organized by the International Federation of Catholic Universities. I thank the president for his words in introducing our meeting. For almost a century this entity, with the motto “Sciat ut serviat”, has sought to promote Catholic education at higher level, benefiting from the great wealth that comes from the encounter between so many universities. An essential aspect of this formation regards social responsibility, for the construction of a more just and more human world. Therefore, you are challenged by the global and complex reality of contemporary migration, and have established a scientific, theological and pedagogical reflection deeply rooted in the social doctrine of the Church, seeking to overcome the prejudices and fears associated with limited knowledge of the migratory phenomenon. I congratulate you, and would like to highlight the need for your contribution in three areas of your competence: research, teaching and social promotion. With regard to the first area, Catholic universities have always sought to harmonize scientific with theological research, placing reason and faith in dialogue. I believe it is appropriate to initiate further studies on the remote causes of forced migrations, with the aim of identifying practicable solutions also in the long term, as it is necessary first to ensure that people have the right not to be forced to emigrate. It is equally important to reflect on the negative, sometimes discriminatory and xenophobic first reactions to migrants in countries of ancient Christian tradition, to propose paths for raising awareness. Furthermore, greater appreciation is due to the many contributions migrants and refugees bring to the societies that welcome them, as well as those that benefit their communities of origin. To give “reasons” for the pastoral care of migrants and refugees, I invite you to deepen your theological reflection on migrations as a sign of the times. “In migrants the Church has always contemplated the image of Christ who said, ‘I was a stranger and you made me welcome’ (Mt 25: 35). Their condition is, therefore, a challenge to the faith and love of believers, who are called on to heal the evils caused by migration and discover the plan God pursues through it even when caused by obvious injustices” (Pontifical Council for the Pastoral Care of Migrants and Itinerant Peoples, Instruction Erga migrantes caritas Christi, 12). With regard to the field of teaching, I hope that Catholic universities will adopt programs aimed at promoting the education of refugees at various levels, both by the provision of distance courses for those who live in camps and centres, and through the granting of scholarships enabling their relocation. By making the most of the dense international academic network, universities can also facilitate the recognition of qualifications and professions of migrants and refugees, for their benefit and that of the societies that welcome them. To respond adequately to the new migratory challenges, it is necessary to train in a specific and professional way the pastoral workers who are dedicated to the assistance of migrants and refugees: this is another pressing task for Catholic universities. On a more general level, I would like to invite Catholic universities to educate their students, some of whom will become political leaders, businessmen and formers of culture, in a careful understanding of the migratory phenomenon, from a perspective of justice, global co-responsibility and communion in cultural diversity. The area of social promotion sees the university as an institution that cares about the society in which it works, exercising first and foremost a role of critical conscience with regard to the different forms of political, economic and cultural power. With regard to the complex world of migrations, the Section for Migrants and Refugees of the Dicastery for Promoting Integral Human Development has suggested “20 Action Points” as a contribution to the process that will lead to the adoption, by the international community, of two Global Pacts, one on migrants and one on refugees, in the second half of 2018. In this and other dimensions, universities can perform their role as privileged actors also in the social field by, for example, providing incentives for student volunteering in aid programs for refugees, asylum seekers and newly-arrived migrants. All the work that you carry out in these great areas – research, teaching and social promotion – find a sure point of reference in the four milestones of the Church’s journey through the realities of contemporary migration: welcome, protection, promotion and integration (cf. Message for World Day of Migrants and Refugees 2018). Today we celebrate the memorial of Saint Charles Borromeo, an enlightened and impassioned pastor, who made humility his motto. May his exemplary life inspire your intellectual and social activity, and also your experience of fraternity in the Federation. May the Lord bless your efforts in service to the university world, and to our brothers and sisters, migrants and refugees. I assure you of remembrance in my prayers and, please, do not forget to pray for me.